Bing. Everyone finally stood up. My two boys were already standing on the seats, so they were at the perfect height for pinging the call buttons on and off. “Quiet hands please.” As if that technique would deter my little monkeys from their own personal touch museum. The dials turn, lights flash, and if you hold onto the back of the seat you can even jump and hit your head. That was definitely the best part. The line finally started moving. This created a sliver of space for us to join the other weary passengers. 11:20pm. It would be only 40 minutes until the ball dropped. This movement unearthed the most significant pile of crap where we were just standing. Smooshed goldfish, torn stickers, lollipop sticks, the ear of a bunny puzzle piece. This sad pile of items that had tried so hard to entertain my children for the past four hours. Remnants of the giggling, screaming matches, meal attempts, and panic attacks (mine) that had occurred somewhere over Pittsburgh. I cannot believe we got through that flight. Our seats had been buttressed by the wall of the bathroom. Across the aisle, I smile to a family that must have responded to an ad in central casting “calm and friendly travelers to help frazzled families.” It was only twenty minutes into the flight when the mother leaned across and quietly said, “I just a visit with my granddaughter. Might I be able to hold one of your boys to give you a hand”? I eagerly threw the weight of my son across the aisle, probably too eagerly. He didn’t even look back at me. He wrapped his chubby finger around her colorful hijab and giggled as she played Peak-A-Boo. Her teenage son showed him colorful lights on his cell phone. This kindness bought me ten minutes. Ten minutes. I stood up to see my husband, one seat in front of me, sleeping peacefully with a sleeping baby on his face. Of course when we played “split the twins” on the tarmac, I chose the one that wanted my face to be a trampoline instead of a sleep number bed. But one sleeping baby meant 33% less to worry about, so I was too happy to be jealous. I coaxed my daughter into the bathroom, rather a torture chamber for children with sensory needs. The walls are too close together, the toilet flushes too loudly, and there is no possible way to change the diaper of a five year old girl. I use the restroom, despite not having to go, because I know this will be my only opportunity. I make a mental note not to drink or eat again for the remaining four hours. We hold our fingers into our ears, dry our hands with the wind tunnel, and practically fall into the drink cart. “Quiet hands, honey.” Why does this phrase keep coming out of my mouth? There is no way I can complete with rows upon rows of cans to slap, spin, and shake. We make it back to our seat. “Momma.” My son calls to me across the aisle, reaching his body over my neighbor’s pretzels and diet coke. He is still clutching the teenage boy’s cell phone. “ It’s cool. He can keep it for a while.” I’ll take anything I can get. We snuggle into our new home: the back corner of American Airlines Flight 55. I offer the first of four lollipops my children will eat on this flight, pick up BoBo the monkey for the first of forty-seven times, and begin my first reading of an inevitable nine renditions of The Hungry Hungry Caterpillar. The flight attendants managed to ignore us the entire flight. There was an occasional sympathetic smile but really an extra bag of pretzels would have been more effective. To say it would be a long four hours would be an understatement. Perhaps a low point would be when I had all three children, two poopy diapers, and a husband stuck in the row in front of me. 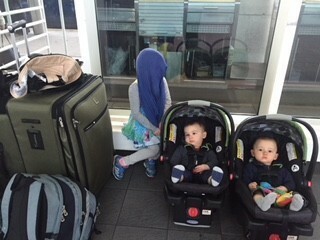 Perhaps it was for the young man in front of me who at one point was surrounded by a baby on his left pulling his hair and to his right, a stranger puking into the complimentary bags. Hard to say. But when the bing resounded, we were all ready to get off the plane. By the time the passengers started moving, it was about 11:45pm. The ball would drop in 15 minutes, just miles away in Times Square. However, I couldn’t leave our sewage behind. We had destroyed our row. It didn’t feel right to make someone have to stay longer to clean up fragments of Dora’s body from a recently destroyed coloring book. I turned to the flight attendants and asked for a garbage bag. She ignored my request and headed towards the back to gather her own belongings and re-apply her lipstick. She must have some big New Years plans. I motioned for my husband to gather our troops, who now having access to a completely empty plane, were playing a fun game of hide and go seek in the aisles. I’m sorry miss. Were you not just on the same flight from Dallas to LaGuardia that I have been on. Did you not hear the screaming that occurred when we couldn’t recline our seats? Could you not show me the same courtesy that a complete stranger showed us when it is your actual job description to assist the passengers while in flight? That means all passengers. Not just the businessman with one slick briefcase or the teenage girl silently binging Netflix. All of us. And this especially true for overwhelmed parents. Parents with children who are afraid to board this flying machine but only do it because Gramps and Grammy will be waiting on the other side. Parents who can barely have control and now have to manage these tiny humans in a cramped twenty inch space. Parents who have to pee because there is no humane way to do it unless a stranger holds your child. But now, you are clearly bothered because we are holding up your New Years plans. No need to think about the maintenance crew that has to deal with our disaster, but yes, let me hurry along because you asked me so politely to do so. I don’t know what prevented me from my tirade. I thought about turning around. I thought about writing a letter, but I never did either. Maybe next time. Instead, I prefer to think about a sweet little girl somewhere who has such a loving grandmother that she will hold stranger’s children on an airplane, even if they do spit up in her Diet Coke. 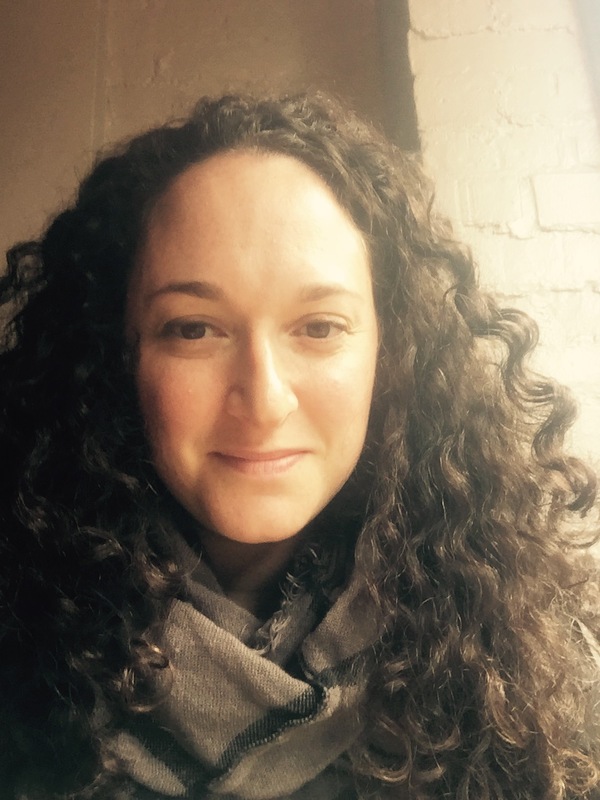 Leah is a high school English teacher who believes in the power of sharing stories. We has a wonderful daughter who has Cri Du Chat syndrome and twin toddlers. She believes parents need a place to empathize with one another and life's odysseys can best be handled with kindness, a sense of humor, and the perfect pair of sweatpants. She writes to celebrate the joy found in the chaos of parenting at her blog www.thecheesebus.com. She is working on her first book.